August 19, 2014 Unsure "Adult"
I am a hoarder. It is not a “disease”. It is a coping mechanism for those who don’t know how to. So, when you’re watching Hoarders, before you judge, think about that! So, when you see the posts of boxes of stuff leaving and bags upon bags leaving, that is not just “stuff” leaving. It is emotional baggage. It is hard work and dealing with emotions. It is determination and love for my family. My mom and sisters worked hard to teach me to be tidy, but it wasn’t something I caught onto quickly. It has taken 23 years to get to where I am and I am proud of it now. I have been busting my rump every move Ryan and I have had to downsize my “junk”. It has taken about 3-4 years. 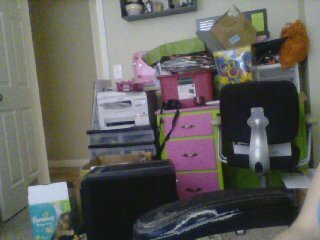 But, I am to the point where I am almost content with how our house looks and have learned to turn my hoarding habits towards couponing for things we need. Without Ryan, my mom and sisters, 40 BAGS IN 40 DAYS 2013 and a lot of healing from place some people will not understand, our house would look like that TV show. It is not something that anyone is proud of, it is something that happens and sometimes it is subconsciously. When you finally realize the clutter, it is hard to know where to start. It’s a day by day, step by step–or bag by bag. You get there. It does not happen overnight, just like the stuff didn’t come in overnight, so don’t expect my house to look perfect. I will have stuff on hand that I probably won’t use, but won’t know until the time comes. Decluttering and downsizing is a healing process. It is hard and brutal. But, when you are able to do it, to not only free yourself of the “stuff” taking over, but the emotional garbage too, it is amazing! You may not be like the “Hoarders” on TV, but don’t judge people who are! You don’t know what they have been through or how hard they work to were they are! It feels like a never ending process. But all you can do is keep going. You choose to drop the pounds, I am choosing to drop the “stuff”. You can enjoy the journey as I post about it or you can judge–if you feel a point in judging, please “unfriend” me now. I am not simply getting rid of “stuff”. I am healing so I can be a better wife and mom for my family. They deserve it–I deserve to be better for myself! Thank you to those who have been supportive and good-bye to those who do not wish to be. This was today’s project. I have been working on the office for the last 5 days! I have Today and tomorrow to finish it up. 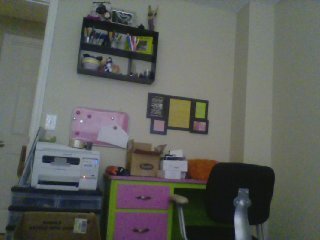 Today I finished up the desk and tomorrow, I will finish up the closet. . I sorted through the red tub and got rid of a reusable grocery bag size load of papers to put in the recycling bin. I have 3-4 projects left to organize. And a pillow to mend. The box on the left is empty and waiting for the wall contents, but I needed a coffee break. So, that is our current progress. Follow along or leave as you feel necessary.